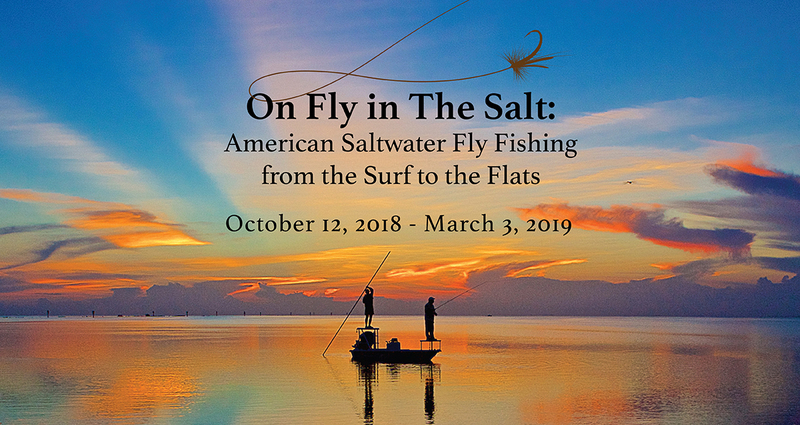 On Fly in the Salt: American Saltwater Fly Fishing from the Surf to the Flats is a curated journey through time, filled with the people, places, and innovations that have made saltwater fly fishing one of the fastest growing sectors of the exciting and dynamic angling industry. Visitors will enjoy tracing the history of saltwater fly fishing through displays of evolving tackle, ranging from fascinating home improvements on early equipment to the incredibly efficient gear of today that allow saltwater anglers to successfully target fish in ways that were inconceivable not long ago. Displays will also include a remarkable photographic record from the earliest days of the sport. This traveling exhibition was organized by the American Museum of Fly Fishing and generously sponsored at the National Sporting Library & Museum by Tim and Jocelyn Greenan.